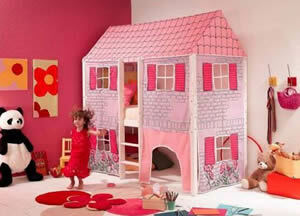 Make your kids bedroom a little more interesting by introducing themed beds for kids - boys or girls. Many types of bed are available to make sleeping and playing more exciting and fun. To make your kids room a bit more interesting and exciting why not consider purchasing some theme furniture? Not only will it make going to sleep more interesting, but it will make a fun playroom during the day to keep them amused and happy. Themed beds for kids come in a variety of styles from digger beds and racing car themed beds for boys to princess themed beds and cinerella coach beds for girls - perfect for the little princess! The novelty or fun aspects to these beds are endless and they are manufactured in a variety of materials, from wood to metal or plastic (the latter usually being the cheaper alternatives). A must for any little boys room! 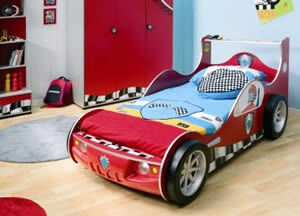 The boys themed bed below is a red racing car bed with bumpers, wheels and even working headlights! It's made by Cilek, a Turkish company who are manufacturing quality themed beds for boys and girls for over 25 years. This type of kids furniture design will make playtime a little more interesting, especially for little boy racers.